Toronto Dogs Directory: Take Extra Care Of Your Pets In This Weather! Take Extra Care Of Your Pets In This Weather! Frigid temperatures are making Toronto unbearable for more than just people. The Toronto Humane Society (THS) is urging pet owners to keep their animals safe and warm. “If it’s too cold for you, it’s too cold for your pet,” said THS vice-president Marcie Laking. 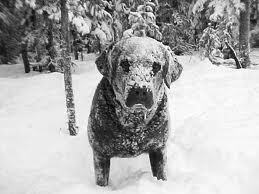 Animals, like humans, are prone to frostbite when temperatures fall far enough. People concerned about stray animals can pick up small portable shelters at the THS’ River St. headquarters which are capable of providing protection from the elements. Animals can also be dropped off at the shelter. “People don’t realize how important it is to keep pets warm, not only in extreme cold weather but cold weather in general,” added Laking. In addition to the cold, pet owners should be mindful that some winter products — such sidewalk salt and anti-freeze — can harm and even kill animals. Kyle Bates, a veterinary technician at Kingston Road Animal Hospital, recommended that pet owners dress their charges in paw mitts and monitor animals’ exposure to the cold. “Nobody wants to see an animal on the street freezing.” he said. The city issued an extreme cold weather alert Saturday after Environment Canada predicted temperatures would fall to -15C or lower to hit the city. Monday’s forecast calls for temperatures ranging from -15C to -5C. Milder temperatures — a high of 2C — are expected Tuesday but the forecast is calling for freezing rain and flurries for the remainder of the week.